Would you like to work from home for a few big name companies? Are you comfortable working phone jobs from the comfort of your home? Do you prefer a variety of phone jobs, including insurance, sales and customer service? Then ContractWorld might be something for you to further explore. ContractWorld is a company that you can sign up at to be able to work for other companies which sometimes only hire through ContractWorld. Some of these big name companies include KFC, Pizza Hut, and L’Oreal. These are all virtual call center jobs for well-known companies that you would be working from at home. ContractWorld is located in Ontario, Canada but does hire in the United States–just not in all 50 states. It appears that they use an IBO model similar to Arise in that you sign up through them and use their portals and training as well as pay fees for training and certifications with various clients. There is no mention of having to incorporate as you do with Arise. What Do Remote Customer Service Agents Do at ContractWorld? Again, remote ContractWorld service agents serve the clients, however they indicate in the training that they want to be served. What Are the Equipment/Computer Requirements to Work for ContractWorld? an updated hardwired PC or laptop with high-speed Internet. a VoIP phone for training purposes. possible other requirements depending upon the client. 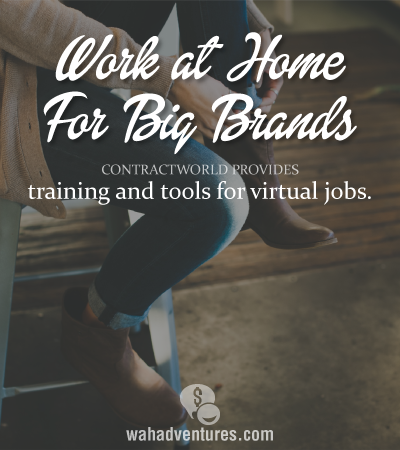 If you have ever worked a work-at-home (WAH) call center job before, then you will recognize most of these requirements as being the basic equipment needed. You probably have most of the equipment already. What Is Training Like at ContractWorld? Again, training is something that you pay for at ContractWorld and it can be anywhere from a two or three-day training session to a few weeks’ of training. There are two levels of training. Both require a one-time fee of $75. The first level is the Business Access Training where you will learn the AgentAccess OS software. This is a one-time 8 hour training session. The second is the Application Training course. This course will take between two and eight days depending on the company to which you are applying. What Are the Fees at ContractWorld? a background check for $45. an ongoing AgentAccess software fee of $29 per month plus an additional $10 for each additional client. A PaySource Direct Service fee of $4.95 or more per month plus $2.50 is added for each additional client. You are an independent contractor and responsible for your own taxes. Should you make over $600 a year, you will be sent a 1099 Income Tax Statement. Some of the fees and certainly the training are considered a business expense, all of which are tax deductible. What is the Pay Like at ContractWorld? Payment will depend upon the client and their expectations, but the pay appears to be from $10 to $16 an hour. You can also work for more than one client at a time, which would also increase your number of hours and therefore your pay. Payment is by direct deposit and is every other week. How Flexible is the Work Schedule at ContractWorld? The schedule is flexible with 30-minute blocks, and the client will inform you as to the monthly number of hours required. What Do Others Say About ContractWorld? Other than complaints about the fees, I didn’t really find too much negative “buzz” about ContractWorld. One guy from Canada did post a very positive video about ContractWorld. What is My Overall Impression of ContractWorld? Again, I wasn’t able to dig up much negative press on ContractWorld. Like all opportunities, what works for one person might not work for another and vice versa. How Can Someone Interested Apply to ContractWorld? You must first become a member by filling out the form. There is a resume builder and a remote certification check list that can help you get started after you pay the initial fees. Then after everything is completed, you are free to apply to jobs. I am currently hiring at home agents. If interested check out my website at http://www.workwithme2day.com you will get paid every Friday. Training and support is the best for any home position. Contact me at courtneyn22@yahoo.com and I can send you all the information and get you started today.